Melissa Valeriote Gives Halloween a Cool Makeover! In keeping with my promise to bring you more Halloween goodness, I wanted to hip you to this amazing artist's work. I found out about her from another writer friend who shares my love of all things spooky, and it positively made my day seeing these hand-crafted gems, made from various gourds in celebration of the most wonderful time of the year! I'd decorate my entire house with them if my wife would let me. And if I had a budget. Of any kind. Anyway, she's on all the social media. Click here for her blog, or just google Melissa Valeriote. Get this stuff! And then send some to me! I don't get cable. No biggie. It just means I'm usually behind on watching some shows people have been watching and raving about for ages. Breaking Bad? Haven't seen a single episode. True Blood? Ditto. Don't even ask about Game of Thrones. The thing is: I actually don't mind being behind on some of these shows. The great thing about getting a show on DVD or streaming it through Netflix or Vudu, or what have you, is that I don't have to wait after a cliff hanger for the next episode, or even the next season. I get to take it all in at my leisure. Take American Horror Story, for instance. I just finished the first season about a month or so ago, and loved it. After a short break while I tended to other things, I have now, for the Scary Season, started watching season two: American Horror Story: Asylum. This season centers around the doctors, patients and nuns in a mental institution called Briarcliff Manor. Listen, there is a LOT going on in this series. You've got your doctor who was a Nazi war criminal, a nun who harbors a guilty secret, a patient who has apparently been abducted by aliens, a psychiatrist who isn't everything he appears to be, a possessed nun...I mean, I could go on and on. In fact, that's probably my biggest complaint about this season. There are so many plot lines to follow, it's kind of...wait for it...crazy. (See what I did there? Not clever? No? Well, sorry. I liked it, I went for it. You get what you pay for, guys, so bite me!) That being said, I am enjoying this season, and would recommend it as we continue with the Halloween festivities. The characters are interesting, the acting well-done, and it's really good story-telling, despite all the disparate plots vying for ascendancy. If you haven't seen it, give it a shot. The characters are completely different from season to season, so don't feel you have to start with the first season (although, that's what I would recommend, since it is a better story). So, off you go. Grab an ice cold one, and the hand of your best girl or guy, and find out what you're really made of. Just remember: Insanity, like beauty, is in the eye of the beholder. Building the Perfect Halloween with Professor Morte's Silver Scream Spookshow: They'll Scare the Yell Out of You! The three witches in Shakespeare's Macbeth knew very well the recipe for a good scare. But if you're fresh out of Eye of Newt, and prefer your pooch's tongue remain in its mouth, where it belongs, Professor Morte's Silver Scream Spookshow's your best bet for fun that won't cost you an arm and a leg...or any other appendages or organs! I blogged about this album last year, when I first became aware of it. 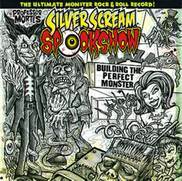 But it bears repeating: Your Halloween collection ain't complete without Professor Morte's Silver Scream Spookshow Presents Building the Perfect Monster. This is a fun, fun, fun collection, reminiscent of the Halloween classic, The Mad Monster Party, with such likable tunes as "Bigfoot Mama," "Little Cousin Creepy," "The Mummy's Rag," and "Lon Chaney." Trust me: if you're throwing a Halloween party, or simply want some mood music for the kiddies who come Trick-or-Treating at your door, Building the Perfect Monster is the perfect CD for you! And just so's you know: Professor Morte's Silver Scream Spookshow is apparently going to be performing at the World Horror Convention in May of 2015! Go here, for details. Keep looking over your shoulder, though. And you never know what's coming with it. It is September 8th, and Halloween creeps ever closer, unfurling leathery, bat-like wings as it approaches, stretching out one bony, talon-tipped claw to clutch at your shoulder in invitation. Or to rip out your throat, if that is what is on its mind. Don't bother turning around. It won't be there. Because it's not your time. Not yet. Behead anything you kill...lest it return from the dead. Vampires can only reach you if you invite them in. Or if you look them in the eye. But there are treats, too, for those whose tastes run to the macabre. For instance, there are these stories, read by some well-known artists, actors, and singers. Closed on Account of Rabies: Tales of Edgar Allen Poe, is a two-disc collection of some of Poe's most celebrated works, including "The Raven," "The Tell-Tale Heart," and "The Masque of the Red Death," just to name a few. Some of the performances are amazing. "The Black Cat," for instance (my favorite) is one of those. It's read by Diamanda Galas, an absolutely brilliant voice actor. I'm also fond of Ken Nordine's recitation of "The Conqueror Worm," and Gabriel Byrne's reading of "The Masque of the Red Death." Christopher Walken reading "The Raven" is an inspired choice ("So softly, you came rapping at my chambuh doah"). And Iggy Pop manages to pull off "The Tell-Tale Heart," just fine. Some of the other performances are...uh...well, just listen to Debbie Harry perform "The City and the Sea," or Ed Sanders perform "The Haunted Palace," and see what you think. Maybe it's just me. Still, as a whole, I just love this anthology. Dr. John does "Berenice?" Really? Yes, he does. And it's pretty good. The point is, whether you're looking for something creepy, something scary, or something fun for Halloween, you really can't go wrong with "Closed on Account of Rabies..."
It's a real treat. So go on, give it a shot. It won't hurt you. You may even like it. But keep the lights on. And if a stranger comes to your door and asks you to invite him or her in, say "No." Well, the Halloween Season is upon us. As I mentioned in a previous blog, I LOVE me some Halloween. Always have. In fact, at one point, I was so determined to wring every last drop I could out of the season, that I decided to begin celebrating a full month earlier! Watching my favorite scary movies, reading all things horror, even putting out my Halloween decorations, all so I didn't end October wondering how I'd missed so much. In my previous blog, I promised to feature something Halloween-ish once a week. Nothing major, just a movie I'd watched, a book I'd read, a message I'd been given on my Ouija board from a disembodied spirit. You know, the usual. I'd meant to begin that this coming weekend, but decided, "Why wait?" So, I'm kicking off the Season of the Witch strong, with a fun remake of a horror classic. I deliberated at length, whether to start Halloween with something light, like "The Frighteners, starring Michael J. Fox, or go full-on, balls-to-the-wall terrifying with something like "The Exorcist," or "Halloween." Eventually, I settled on something in between. What I ended up watch is "House on Haunted Hill." This remake of the cult classic starring the late, great Vincent Price, stars Geoffrey Rush and Famke Janssen as a twisted couple hosting a birthday party at an abandoned institute for the criminally insane. Five strangers, played by Taye Diggs, Ali Larter, Bridgette Wilson, Peter Gallagher and Chris Kattan are the party-goers, who stand to win $1 million each: if they can survive the night. But the hosts' sick games and growing paranoia among the group of party-goers is nothing compared to a house that's haunted by the ghosts of the psychotically insane former residents. The "House on Haunted Hill" remake is a fun movie. It's got the usual sudden scares and creaky doors you'd expect. Plus, it's got a bit of humor (Chris Kattan is pretty funny as a descendant of the man who originally ran the institute - a man who just missed being an inmate himself by that much!). And there are some genuinely creepy moments, as well. It's no "The Exorcist," or "The Ring," but it's a solid enough Halloween movie to kick off the Howling Season with. So if you're looking for something with a few laughs as well as a few scares, you just might like this one. By the way, I do have the original movie, and I will likely be watching it soon. Do though likewise. It's good stuff.